I'm basically a noob when it comes to dealing with packages and TeX distributions. I currently have both MiKTeX and TeX Live installed with MiKTeX as the default distribution (I think), but I would like to change to TeX Live. The problem is: How exactly do I change this? I am using Windows, and the editors I use are Texmaker and TeXstudio. When you compile a document foo.tex with, say, pdflatex through Texmaker, what happens “internally” is that in foo.tex’s directory, pdflatex foo.tex (probably with a few options) is called, as if on the command line. But how does Windows know where pdflatex is? Odds are your document is not in the same directory as your *TeX binaries. The answer is the PATH. 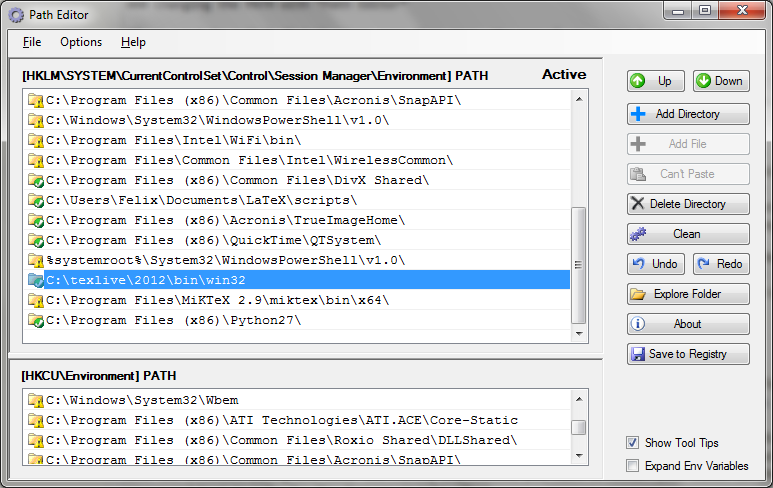 The PATH is a system variable containing a list of directories in which Windows will search for something executable called pdflatex, starting with the first one, until it found something. Follow Paulo’s great description to your path (probably the admin path) and look for the two TeX entries; mine are C:\texlive\2012\bin\win32 and C:\Program Files\MiKTeX 2.9\miktex\bin\x64. To reverse the order, it might be helpful to copy the entire PATH into a text editor since the miniscule one-line text field in the Windows dialog is just uncomfortable to deal with. Then, simply switch the order of the two directories by copy-pasting, copy the entire PATH back into the Windows dialog and click “OK”. In my experience, you have to restart your editor (or the command line) in order for the changes to take effect. Calling tex --version again should confirm your change. Simply change the order of the two entries with “Up” or “Down”, click “Save”, and you’re all set (after the editor restart). Not the answer you're looking for? Browse other questions tagged texlive miktex windows distributions or ask your own question. How to update MiKTeX 2.8 to 2.9 in WinEdt? Can I run a file using MiKTeX and TeX Live?